Deep Freeze 8.23 is now available. This version has made several additional enhancements that makes our handling of Windows updates even smarter. Read on to understand what improvements we’ve made in this version followed by how we’ve improved this functionality over the years. Download it from Faronics Labs today. Because of the bulletproof nature of Deep Freeze where no exceptions can be made, disrupting the Windows updates process can become problematic. By its nature, most newly installed Windows updates require a restart and remain “pending” until the next restart happens. Upon a restart, these pending Windows updates go through a finalization process which may also instigate another restart. Customers experience bootloops in cases where they have somehow managed to Freeze the computer right in the middle of a pending restart. The computer would restart Frozen and Windows updates would continue to “finalize” the updates where several restarts may be required. In this case the user will never be able to access the desktop and therefore will not be able to Thaw the computer in order to permanently finalize the Windows updates. This issue becomes severely magnified when third party solutions are used to perform Windows updates. Prior to this release, Deep Freeze would reboot into a Frozen state right after installation or as soon as the Freeze command is received and would immediately restart the computer. In other words, Deep Freeze did not respect any pending Windows Updates that could result in a bootloop if interrupted. We have also now added a new Delay Frozen reboot to complete Windows updates option that prevents a computer from going into a Frozen state when the installation/configuration of Windows Updates are pending. This option ensures that all pending Windows Updates are completed and handle all additional restarts before the computer automatically goes into a Frozen state, thereby avoiding bootloops. When Deep Freeze is handling the additional restarts, the Deep Freeze Console will display a new status called “Finishing Windows Updates”. Deep Freeze now intelligently detects if Windows Updates are pending. On detecting pending Windows Updates, Deep Freeze does not proceed with the installation by displaying a message. Only when the pending Windows Updates are completed, Deep Freeze allows the installation to proceed. Over the past couple of years, we have been working on numerous improvements ‘under the hood’ to make Deep Freeze ‘smarter’ to minimize bootloops during the Deep Freeze Windows Update Workstation Task. As you may know, Deep Freeze provides the built-in ability to automate your Windows updates so you don’t have to worry about performing these updates manually using third party solutions. With the Windows Update Workstation Task, Deep Freeze will Thaw the computers, install all critical, security, and service pack updates and Freeze the computer back up. We will connect to the Microsoft Windows Update website or use your inhouse Windows Server Update Services (WSUS) and even handle the end-user notifications, locking of the keyboard and mouse, to ensure these updates are not disrupted. By the way, since customers always ask this, if you choose the WSUS option, we will install ALL updates that are available on that server, not just critical updates. 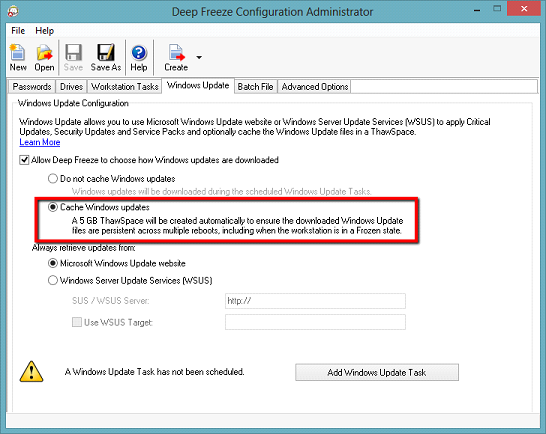 During a Windows Update Task, Deep Freeze installs the Windows updates and then performs an unconditional reboot to ensure all updates are configured and completed before the task ends. This provides a safety net as Windows updates may fail to properly tag their tasks for an additional restart if one is required. As an additional measure to prevent bootloops, Deep Freeze checks for pending Windows Updates after the unconditional restart mentioned above and will automatically handle any additional Thawed restarts before restarting the computer into a Frozen state. By setting up a guaranteed End Time in Deep Freeze, customers with many pending updates still ran into the bootloops problems because there was a chance we can interrupt the process. 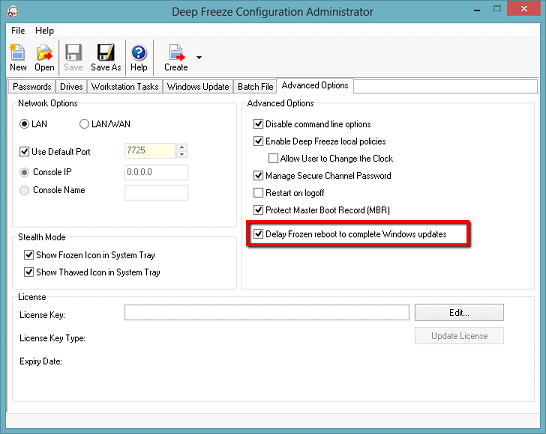 We introduced a new When Windows Update completes option to ensure that Deep Freeze exits the Windows Update Task only when installation and configuration of the Windows Updates are completed. Another problem our customers ran into was that the Windows Update Workstation Task was using precious time during the maintenance period to download the updates. By the time the updates are still installing, the task ends and again interrupts the updates process. To solve this issue, we introduced the Cache Windows updates option to ensure that the Windows Update files are downloaded and retained on the computer even when the computer is in a Frozen state. This saves valuable time since downloading Windows Update files can take hours depending on the speed of your connection. Customers can now be assured that the Windows Update Workstation Task is exclusively used to install/configure Windows updates. Ending the Windows Update Task (via the context-menu in the Deep Freeze Console or through the Deep Freeze Command Line interface) abruptly ends the installation and configuration of Windows updates. We improved Deep Freeze to detect pending Windows Updates and end the Workstation Task gracefully by allowing the pending installation/configuration to complete before rebooting into a Frozen state. 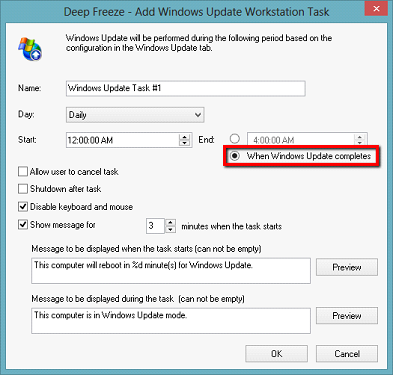 We have optimized the Windows Update Task in two ways: (1) If there are no new Windows Update files to install, Deep Freeze exits the Windows Update Task after checking that there is nothing to update – quickly freeing up the computer or shutting it down as per the configuration. (2) Caching Windows updates also reduces the time it takes for the task to complete whenever the When Windows Update completes option is selected. We hope that these built-in improvements will ensure smooth Windows updates with Deep Freeze and make our customers’ lives even more simpler!